This Garden Room has recently been installed in our customer’s large garden in Sutherland, Grampian. The customer isn’t living at this location yet, it is going to be her retirement home that she’ll be moving into shortly, and this Garden Room is going to give her a wonderful spot to sit out and enjoy her garden from in style. 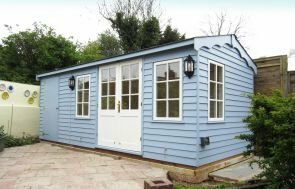 At 3.6 x 4.8m in size, this is a large Garden Room; it has a hipped roof with grey slate composite tiles, shiplap cladding and Valtti Sage has been used to coat the building in an opaque and weather resistant paint. The Garden Room has got double doors in the front that have been inset into the building, a set of Georgian windows on both sides of the doors, and a set of two Georgian windows on both sides of the garden building. All the windows can be opened, and the inset doors and corner boards give the building a bit more by way of style. The guttering is black, and coach lights have been fitted, one on both sides of the doors, to light the garden up in the dark. Inside the Garden Room, the customer has got painted matchboard lining on the walls, full insulation in the ceiling, walls and floor, heavy duty flooring and an electrical pack, so this building is perfectly suited to year round use, not just during the warmer months. Just a short note to say how pleased we are with the Garden Room, and how impressed we were with the team that laid the concrete foundation and the second team that erected the building. Both were led by Cliff who was hardworking, effective, efficient and, above all, competent. I had every confidence in the on-site workmanship. Thank you. We hope the customer really enjoys their Garden Room, and gets many enjoyable retirement years from her new home. 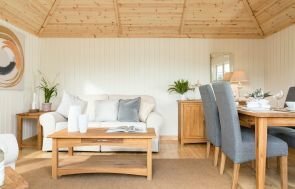 If you would like an outdoor living/relaxation area, please have a look at our range of Garden Rooms, Garden Studios and Summerhouses to see if any of these look suitable for you. We have a range of our garden buildings at our six show centres across the country. We have show centres at our factory HQ in Norfolk, Edwalton in Nottinghamshire, Burford in Oxfordshire, Newbury in Berkshire, Sunningdale in Surrey and Brighton in East Sussex, so if you’re close to any of these, please come and have a look to see what you think. Alternatively, you can contact us with any queries to receive a call back, or call us on 01760 444229 to go through your requirements with one of our helpful team.